Doug has been in private practice since 1980 focusing on residential work from custom houses to builder homes, starter condominiums to seven figure high end residences. I read with interest Bob’s blog post relating to his design technique on his recent trip to Wisconsin for a new client. I made one post there and was going to add to that with another post with more photos when he suggested maybe expanding it to a separate “guest” column on his blog which I happily accepted. For years I have done all my initial design efforts for individual clients in face to face, highly participatory meeting with the owners. I call them “charrettes”. From Wikipedia: “A charrette (pronounced [shuh-ret]), often Anglicized to charette or charet and sometimes called a design charrette, is an intense period of design or planning activity”. The inspiration came from Kentland’s, a TND community in Gaithersburg, MD designed by DPZ in a three day design charrette involving an entire community. We were participants as we were one of the three architects slated to design the first houses. Kentland charrette video is here and Kentland’s history here. I figured, “Gee, if a whole town can be conceptualized in three days with a very successful result, I can surely conceptualize a small project in one day!!”. I’ve always been a believer that the best designers are fast on their feet so I gave it a try. Very nervous at first as this is design in “real time” as Bob says and the truth is I still am nervous going into one but once we get rolling the butterflies go away. It’s like being the lead in a play and the curtains going up on opening night to a full house and there’s been no rehearsals. For small projects I have never met the owners before nor visited their house to preview the program. The first time I meet them or see their house is when I first walk in their front door. For whole houses I walk the site with the owners beforehand but when design starts all that is in “real time” too. As I said above, these are “eyeball to eyeball”, intense, interactive and highly participatory where no spectators are allowed because everyone is a participant. It may look like I know where I’m going from reading below but the truth is I don’t. These are all completely unscripted. -ALL of the decision makers need to be there with their undivided attention. It’s very unproductive to be missing one essential person only to have that person provide input at a later time…..”Gee, Frank my husband looked at what we came up with and really doesn’t like where we put his study and has these ideas for the kitchen.” Frank needs to be at the charrette to voice those concerns/ideas then. After all, that’s the WHOLE PURPOSE of the charrette…Getting everyone’s input then, not in piecemeal form later. -Their attention needs to be focused. I don’t mention cell phone use but it does effect the charrette to have one person always in another room on the phone only to keep coming back and saying “Now, where were we?”. One or two short calls is no big deal but if it’s too much I usually just stop things until that person returns and usually the other person eventually says, “Honey, we need your attention in here.” Same thing goes for other distractions. Had one where some tree trimmers showed up an hour into the charrette and the husband was suddenly out in the front yard all the time. And BTW, be sure to turn off your phone. -I always do these charrettes first thing in the morning (9AM start or so). I’m a “morning” guy anyway and do my best design work then and generally everybody is fresher in the morning when their mind is uncluttered. Sooner or later you’ll get a request to do one after work (since it’s your rule that everyone essential has to be there!!). Forget that. These are pretty intense and starting one after the client has worked 8 hours or more and is likely stressed won’t help any. Also, in the winter, late it’ll likely be dark when you need to look at/photograph the outside. Of course, this might present you with a problem in that the only times everyone’s available is on a Saturday. I generally don’t work on weekends but I make an exception for these charrettes as it’s more important that everyone be there and be fresh. -Have the client/owner find out all zoning rules ahead of time (setbacks, heights, lot coverage, HOA restrictions, etc.). Nothing’s worse than to have the perfect solution only to find out later you’re 18” over a building setback line. -You’ll need a template so find out if the client has a to scale plan of the existing house. If they do, have them PDF it over to you ahead of time so you can get it to a scale you’re comfortable with before the charrette (for me it’s usually ¼” scale). If they don’t have a drawing, see below. That’s it for the client/owner. Now for you……. 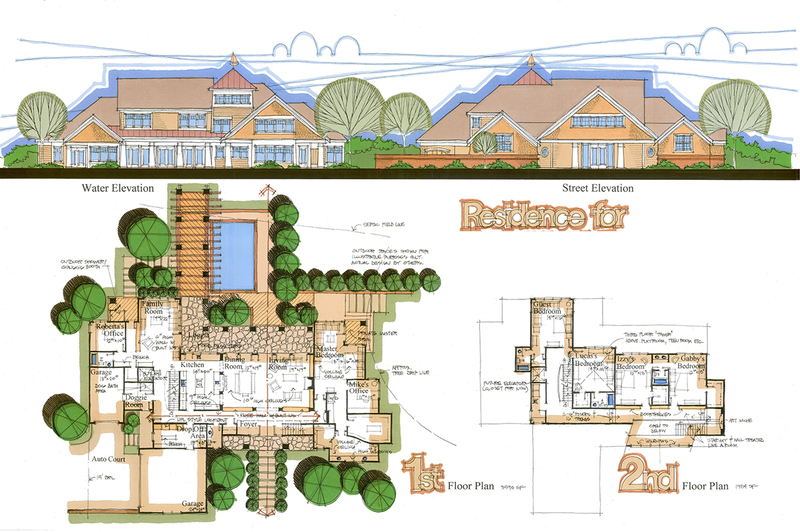 -If the client doesn’t have a scaled drawing, come prepared to make one. Doesn’t have to be fancy, this is just a template for the charrette. Down the road you can take exact measurements of critical areas of the structure as required. I bring a 30’ tape and laser measurer. If there’s two other people at the charrette (usually is), I have them run the tape at my direction and I do all the drawing at ¼” scale. I don’t actually write down any measurements. If I say “Ok, give me the dimension from that corner to the edge of this window” and they say “6 feet 2 inches”, I just drawing a line using the edge of my scale 6’2” long. I don’t use a computer (see below as to why I don’t use a computer at all) for this as we need the template right away and it will likely be too large for the typical home printer. Below is my typical measuring stuff. 18”X24”X¼” thick plywood with several 18X24 sheets clipped in ready to go. Very low tech but it does the job and it’s not cumbersome to carry around. The plan shown is of an existing house that we made it in about 30 minutes and it’s a typical template. I just drew all the lines with the edge of the scale, eyeballing right angles. And nothing’s sweeter than going around a whole house, taking dozens of dimensions and you say, “Ok folks, according to my scaled drawing, the length of this final wall should be 25’8”” and they call out “25’6”….SWEET!….close enough!!!! (Hint: When making measured drawings always try to take multiple measurements from the same point to avoid additive errors. For example, locate all openings in a wall from the same corner as opposed to measuring a wall, then the opening, then the next wall, then the next opening, etc.). Bring a camera and take photos of everything. There’s no such thing as too many photos. This does a coupla things. First, if the project goes ahead, you maybe won’t have to come back just for photos and second, when you’re inside the house in mid charrette and you’re wondering how that gable is outside, etc., it’s usually easier to look at the camera screen as opposed to always going back outside. Also, I’ve loaded them on a laptop too so I can see them bigger. Don’t use a computer for the charrette. Plenty of time to use one later for 3D modeling. When you’re with the client exploring initial ideas you want the session to flow and be highly interactive and participatory. I found early on a computer was no match for a pen and bumwad (paper) in that regard which everyone has used since they were two. If the client has an idea it’s a whole lot easier to hand them the pen as opposed to saying “Now press “L” for the line command and move the mouse this way…..” etc. Also, the typical computer has a limited view field for looking at the screen (see next item). Finally, you’re going to be generating a lot of drawings. With the computer all these have to be named and saved somewhere. With bumwad overlays, just lay them on the floor or pin them up so when you need the one later that had the cool L shaped kitchen, you can visually scan 30 drawings on the floor in 15 seconds to find it. Always try to sit the client across from the table from you. That way your hands won’t obscure their view of what you’re drawing, nor their hands blocking your view of their ideas. And don’t worry, over time you’ll get very adept at drawing elevations and sections upside down!! Leave ALL the drawings with the client. Even the meaningless ones. Leave it up to them as to which ones to throw away. If one approach turns out good I usually spend some time at the end “cleaning it up”, getting parts that might be on several drawings incorporated onto one. When the client wants to proceed, they either drop the originals off or send them back as I like to work with the scaled originals. I don’t worry about a contract at this point. Contracts are mainly for liability and there’s no liability in looking at ideas. Beforehand I let email exchanges handle charrette fees, etc. and I’ve never been stiffed yet for one. If the project goes ahead I get a signed contract then. And with no legal mumbo jumbo at the charrette it helps you bond a little better. Don’t worry about being nervous. This is perfectly normal and you’ll calm down once you get going. But the initial nervousness will never go away no matter how long you’ve been doing these. If your client comes from a builder referral as most of mine do, keep in mind a big intangible here is you want to make the builder look good and he/she is depending on you to do that. You’re not really a “sub” like the tile guy of course but in many ways you are the first “guy/girl” the builder has come on the job and if you do well then in the eyes of the client you’ve placed the builder high up there in their minds. When you leave for the charrette, TRIPLE check you’re bringing everything in your “Doctors” bag. Once I forgot the bumwad and, after a moment of sheer panic, managed to wing it with the few meager pieces of the vellum I bring for the measured drawings (drawing small!). It was kinda like starting a long road trip with the tank ¼ full and hoping I’d make it (I did!). About the longest you’ll be able to go is about 6 hours. Take numerous breaks to rest the brain. And remind the client, that while these are one day sessions, it’s not like you’re doing this with idling bulldozers down at the site. There’s plenty of time to “sleep on it”. Assure the client that they set the timetable. Don’t schedule these too close together. You’ll find they’re draining and you won’t be really “up” creatively for a day or two afterwards. These houses were conceptualized in one session each. For small projects, I can usually finish it right there but for whole houses I typically have to fine tune the concept drawings which I do a few days later but there are generally no surprises for anyone. 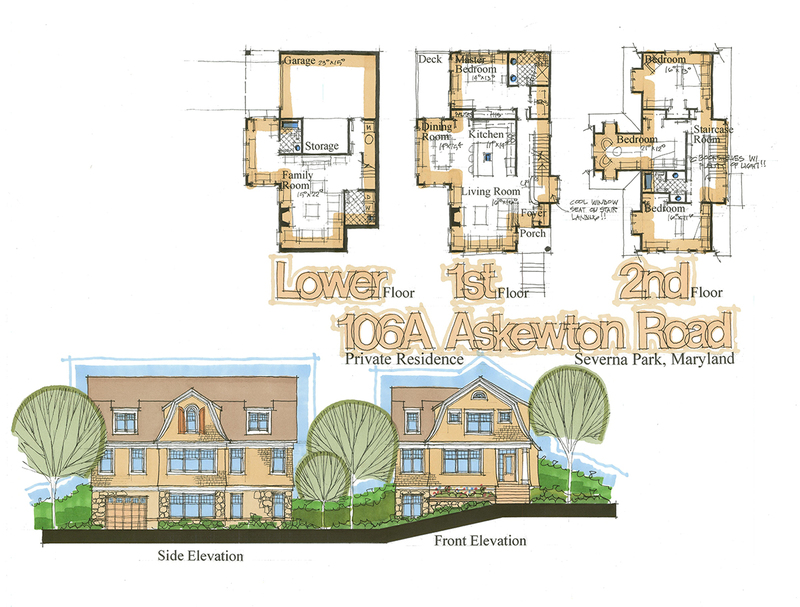 Askewton: Tough site with an easement along the left side going to another house in the rear. I’d like to thank Doug for adding his perspective to on-going conversation of the design process. Doug has been at this awhile and you can look at his sketches and tell that he is skilled at sketching accurately. I’m not entirely convinced that this process is right for everyone, but I do think it is a great way to engage people in the design process.